A front door is so much more than just a door. Bringing character and a sense of identity to the front of your home, your doorway makes a huge difference to the first impression your home projects. So if style really matters, what’s trending? We take a look at some of the designs already gripping this year’s market. Strong and vibrant colours will provide a fresh, clean look and can also provide a wonderful contrast to the overall colour of your house. To prevent this splash of brightness looking out of place, the similar colour should be used in either signage, plants, furniture, or something similar surrounding the door frame to tie a colour scheme together. Glass or no glass, that is the question. If you are firmly in the glass camp, the good news is that glass panels and the use of glass patterns within a doors design are getting larger. It’s not uncommon to find front doors with a three-quarter size glass covering now, with security and energy efficiency no longer a problem presented by such coverage. Mirrored glass is also becoming a more popular option, providing more light and privacy than frosted glass but bringing similar benefits to your home’s interior. A textured or artistic glass is also becoming more widespread and is yet another way you can retain some privacy while making the home more welcoming. The future has often been portrayed through stark, minimal designs since the early 1900’s and is still used today in contemporary design. One of the better uses of this concept in recent designs is both with flush and pivot doors which both provide a sleek look to your home through the use of uncomplicated, clean lines in their design. 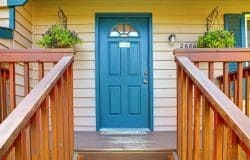 As your front door acts as the gateway into your home, it’s one of the first things a visitor will use to inform their first impressions. Because flush doors operate with a clean and clinical calmness with their smooth action, they impress in both their operation and their appearance to give you a double-win. Doors of a minimal look always look best on homes which have plenty of character and detail in their surrounding exterior. For houses which carry a more stripped down appearance, your front door should contain the decoration and patterns to add balance to the overall look. Furthermore, the use of the pattern has become much more adventurous in recent years. While shaped panels have been commonly used in most door design for decades, cubist art such as that of Pablo Picasso is slowly creeping into the world of the front door. This may be a little extreme for either your taste or for your house’s appearance, however, some of the better ones incorporate this style subtly for an amazing look. The idea that doors need to have a solid wood look is quickly becoming outdated. With fibreglass doors now offering cheaper alternatives to wood without any disadvantage in performance, designs have also become more flexible. The use of metal and chrome in front door design is one trend which is quickly proving popular. Inlaid strips add a definite modern look as well as a subconscious feeling of strength and added security to the doors stature. Whether wide or narrow, these don’t have to be linear inserts and some of the best modern front door designs of 2018 have arcs of metal in their design to give a truly contemporary feel. The use of materials not commonly associated with a front door is a great way to make a striking visual impact. Metallic doors themselves are no new concept, however, the range of choice with this style is rapidly growing. Beyond the original security-minded metal doors, futuristic designs are using metal as a canvas to create some serious wow-factor. It’s not only metal either. The effect of stone, brick and even glossy lacquered doors can be used to add drama to a home’s appearance. With laser carving now readily used in a lot of door manufacturing, these materials can also be embellished with further designs to make them even more eye-catching. Whatever style of door you settle for, the door handle should play a key part in your decision-making process. As the main feature of any door, the handle’s style is equally as important as its functionality. From decoratively sculpted lever handles to simple doorknobs or elongated chrome handles, there are many options now available. Because the handle can be an independent choice from the door itself, this also allows for extra creativity and personalization in your choice. One of the more interesting ideas this year is for handles to be shaped into the house’s street number, however, handle-less doors are also becoming increasingly popular. Electronic keypads which use either number entry, key fob or even fingerprint recognition are on the rise and can add an extra element of innovation to your overarching design. With more choices than ever before, choosing a front door can now be tailored closer to your personal tastes. Once you’ve decided on a suitable budget, picking a material and some preferred colour choices can help you on the way in narrowing down this selection. Beyond that, knowing what’s available is all important. At Imperial Windows and Doors, we have been helping match and install doors with happy customers for over 10 years already. For more information about our available range and services, contact us now to speak to an expert.